AMD showed at the New Horizon event that their upcoming Ryzen 8-core 16-thread processors running at 3.4 GHz with 20 MB of cache can compete with the Intel Core i7-6900K Broadwell-E processor, which is Intel’s High-End Desktop Platform (HEDT) 8-core 16-thread CPU (3.2 GHz base/3.7 GHz Boost/20MB Cache) that costs $1029.64 shipped over at Amazon. That is impressive seeing how the AMD FX Series of processors struggles to keep up with most any Intel quad-core processor released over the past several years. We’ve never actually benchmarked the Intel Core i7-6900K processor and seeing how AMD is focusing the performance of Ryzen against that particular processor it seemed like it might be a good idea to have an Intel 8-core processor in our benchmark charts for comparison sake. 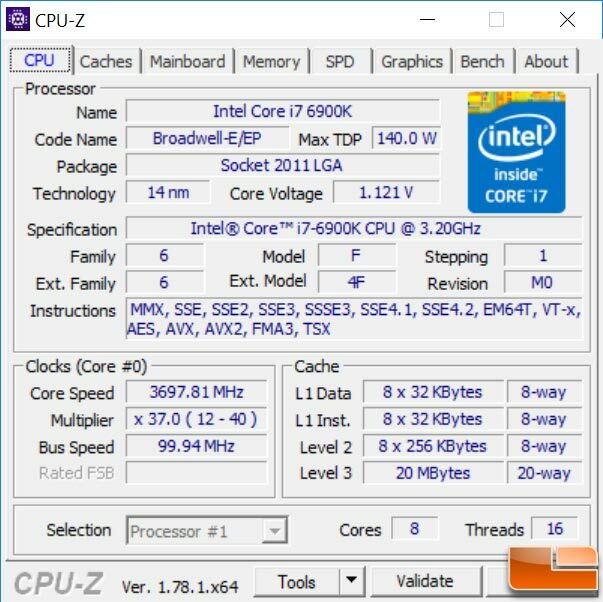 We are also very interested in seeing how the 6900K performs in our updated benchmark test suite for 2017. The Intel Core i7-6950X and Core i7-6900K processor are aimed at those that need as many processing cores that they can get on a desktop platform. If four or six cores aren’t enough and you have the proper funds, you can move up to an eight or ten core processor. Thanks to Intel Hyper-Threading technology you’ll actually end up with double that number when it comes to threads, so you can run up to 20 simultaneous operations at once! All four of these HEDT parts have Intel Turbo Boost Max 3.0 and the good news on that front is that Microsoft has been offering native support for that since Windows 10 Anniversary Update (version 1607 and beyond). If you are running an older OS you’ll need to install a separate driver on Windows 7, Windows 8.1 and earlier Windows 10 releases. You can find that driver here if you are needing it. 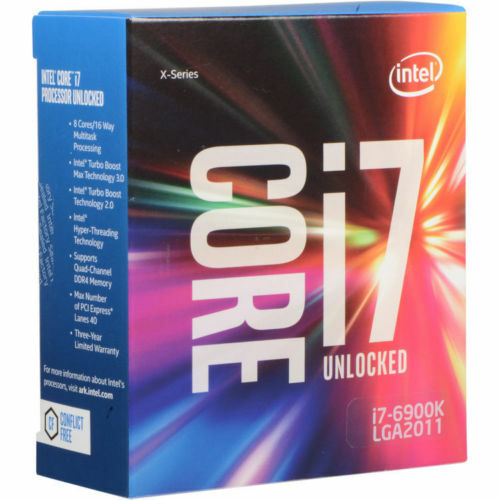 For those that have unlimited cash and want the most cores available, the Intel Core i7-6950X for $1635 is the easy choice. If you actually have a budget the Intel Core i7-6900K is an interesting processor as it costs roughly 37% less than the 6950X and has faster clocked cores despite having 20% fewer. The Core i7-6900K’s base and boost clock speeds are each 200 MHz higher than the Core i7-6950X 10-core processor, so it might actually be faster on lightly threaded applications. Both processors have 40 PCI Express lanes, so you don’t have to worry about the limitations of the Intel Core i7-6800 on Intel X99 platforms. Since this processor has been out since Q2’2016 we’ll get right to the benchmarks after looking at the test systems on the next page.